Our park's highest elevations around Newfound Gap and Clingmans Dome received their first dusting of snow for the season on Friday night into Saturday morning. The frozen precipitation, sparkling at first under a grand sunrise, did not hang around long, however, as the day's bright, sunny sky dominated the landscape. With little to no leaves remain at the highest elevations as of this weekend, the park's fall color show has moved down the mountains into the mid- and lower elevations, where incredible red maples and sourwood trees are mixing with yellow sugar maples and browning magnolia leaves. Beech and oak are adding to the display, making drives into Cataloochee Valley and Cades Cove some of the very best places to visit with cameras at the ready. If you're looking to capture some wildlife images along with our fall foliage display, make plans to visit Oconaluftee Visitor Center, where our growing heard of bull, cow and young elk can be found most evenings lounging in the grass-filled fields. Two days of high winds here in the Smokies did their best to rid our trees of their vibrant leaves, but all was not lost. Incredible color remains on display across the park. Driving suggestions for the best color include both open sections of Foothills Parkway, as well as Lakeview Drive out of Bryson City, North Carolina. There's a good chance most of this season's color will continue to hang on for next week's opening of the new Foothills Parkway section, too. Multiple shades of gold, deep crimsons and pinks, amber, peach and coral, even the russet browns – each color is electrifying. Hiking the newly opened Sugarlands Mountain Trail is also highly recommended, as this trail provides views from all elevations, starting at nearly 6,000 feet near Clingmans Dome and ending at low elevation near Laurel Falls. The Smokies are alive with the vibrant colors of fall. All elevation levels are showing-off with trees in radiant shades of red, gold and orange. For example, sourwoods, red maple, and sugar maple all have brilliantly colored leaves. Others with colorful foliage are: mountain maple, scarlet oak, hickory, sassafras, beech, dogwood, false Solomon’s seal and Indian cucumber root. A great spot for viewing the color change in the lower elevations is Metcalf Bottoms. And if you are looking for a hike, take the Little Brier Gap Trail to the Walker Sister Cabin and revel in the fall colors. As October begins to fade, the autumn color display is just getting started. Now is an ideal time for a drive or hike through the Smokies as a golden haze has taken over the higher and mid elevations. Higher elevations are approaching peak color as trees and shrubbery begin to change, some at rates faster than others. Rich Mountain Road: Sourwood, sassafras, sugar maple, red maple and dogwood are starting to change. Indian Grave: Showing outstanding color, possibly near peak display. Sugar maple, sassafras, beach and scarlet oak are all displaying color. Rich Mountain Trail: Sourwoods are showing brilliant shades of red while red maple, beech, sugar maple and mountain maple are changing as well. The higher elevations on Rich Mountain appear to be approaching their peak color. Colors are likely to reach their peak within the next week or two. The trees of Great Smoky Mountains National Park may have escaped the paths of Hurricane Florence and Michael without sustaining much damage, but the abnormally warm temperatures have taken a toll. This year, peak color appears to be running an estimated 10 days behind schedule but could speed as temperatures continue to drop. Trees could catch up with their regular schedule or there’s a possibility that the colors will be muted this year, with some red maples and yellow poplars dropping their leaves before changing. Some trees are showing color now. Along Big Creek Trail in the lower elevation, sourwood, red maple, beach and tulip poplar are all starting to turn. However, out of the total foliage, only an estimated 5% are currently changing. 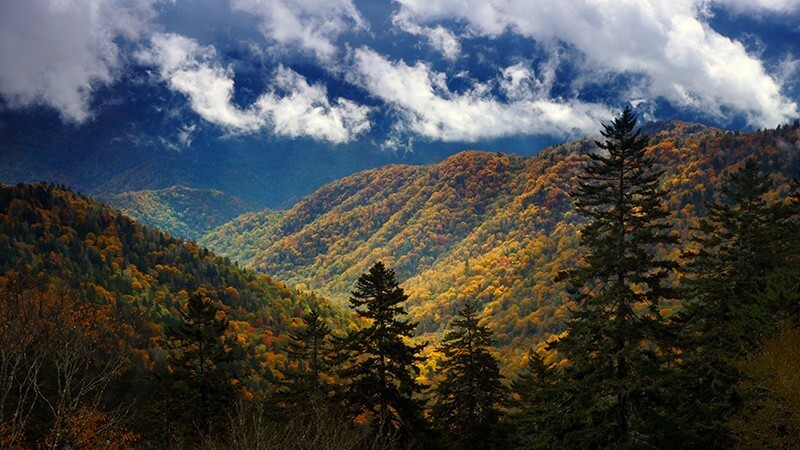 Bonus: Did you know, Great Smoky Mountains National Park is home to over 130 different species of trees? Fall color is currently behind normal schedule due to unusually warm weather. Many trees have yet to change and others are not as vibrant as in previous years. However, spots of fall foliage continue to pop throughout the park with most color evident in the higher elevations, above 5,000 feet, in places like Clingmans Dome and Newfound Gap. Bits of fall foliage are also scattered through the middle elevations like Chimney Tops and the lower elevations such as Metcalf Bottoms. As temperatures prepare to drop, we’re likely to see more significant color within the next couple of weeks. 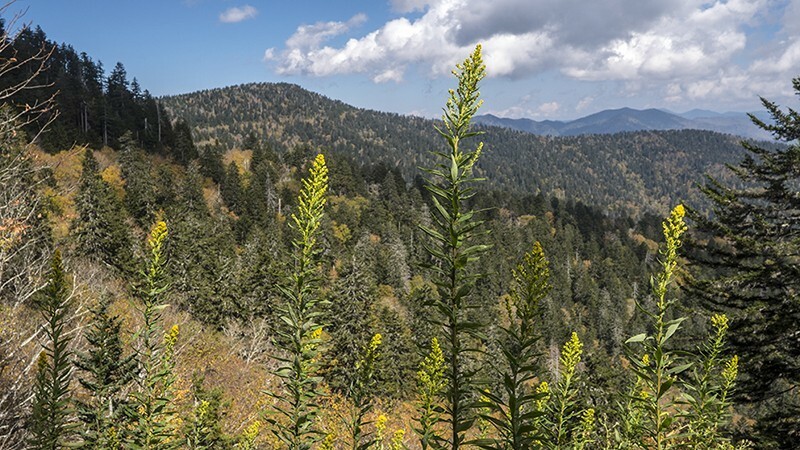 Spots of color are peaking through at the park's higher elevations around Newfound Gap and Clingmans Dome, along with the Appalachian Trail ridge line. Few changes are currently visible in the middle elevations, mostly due to current summer-like temperatures. Visitors today will see lots of green among the scattering of fall colors when driving and hiking in the Smokies. Virginia creeper vines, along with sourwood and dogwood trees, are the most notable of the early changers, with some weaker, struggling trees often being the first to change. Fall colors are beginning to shine through in the higher elevations. Now is a great time to take a drive on Clingmans Dome Road, the Blue Ridge Parkway or Balsam Mountain Road and enjoy the rich golds from the yellow birch and American beech trees and some reds from maples. If you would like to enjoy fall foliage outside of the car, a hike to Andrews Bald on Forney Ridge Trail or along the Appalachian Trail to Charlies bunion would do the trick. The fall color display usually reaches its peaks at higher elevations between late September and early October. Fall is officially here, and the trees in Great Smoky Mountains National Park are beginning to show-off their fall colors. The colors are coming on the strongest at the highest elevations in the park. Witch-hobble leaves are turning burgundy, a smattering of dogwood trees have started to change and blackgum trees will soon be blushing red. Colors are also changing in the lower elevations, like along the Little Brier Gap Trail to the Walker Sisters cabin in Metcalf Bottoms where the sourwoods are already turning a nice shade of red. The fall color display usually reaches its peak in the park at mid and lower elevations between late October and early November. Along with the brilliant fall colors, now is also a good time for elk viewing. With the elk rut in full swing, good places to see elk include Cataloochee Valley and the fields around Oconaluftee Visitor Center. Approaching elk or bear closer than 50 yards is strictly prohibited. Some fields will be closed to the public during the rut. Fall foliage is beginning its final encore and over the next week should display beautiful color in the Cove Hardwood forests that are found in the mid to lower elevations. Currently, the higher elevation Northern Hardwood forests are past peak and mostly defoliated. It was mostly a below-average year for peak color in the higher elevations as most of the leaves turned a brownish orange before falling off during the snowstorm last Sunday. The middle elevations now display mix of peak color, combined with trees that are defoliated, and even some trees that are at peak. The lower elevations on the western side of the park still have about a week to go before it begins to hit prime time. The eastern side of the park has a mix of trees at peak, and trees just beginning to change. This period should last at least two more weeks before the trees are defoliated. The best areas to view the fall foliage are the Foothills Parkway, Deep Creek, lower elevations along Newfound Gap, the Blue Ridge Parkway and the Roaring Fork Motorway. Crooked Arm (B-E) and Indian Grave (from Crooked Arm to Rich Mountain Loop Trail) – The report is somewhat flawed because most of the foliage was covered with a wet snow. I could see some colorful foliage on Red Maples, Sugar Maples, Sweet Gum, Beech, Sourwood, Mountain Maple and Tulip Poplar. Rich Mountain Loop (B-E) – By the time I got on this trail the snow was melting. Some of the Sourwood, Red Maple, Sweet Gum, Hickory, Beech and Sugar Maple were quiet colorful especially against the blue sky and what snow that was hanging on. The Sourwood foliage is at peak color – very beautiful and many of them – some bright red, some orange, some pink, some salmon and some light red. Also the following have outstanding displays of colorful foliage: Sweet Gum, Red Maple, Sugar Maple and some of the Beech and Hickory. The following’s foliage is changing but not that colorful: Dogwood, Redbud, Greenbrier, Mountain Maple, Blue Berry and Scarlett Oak. The display of foliage is nice on this trail especially after the first mile up the trail. 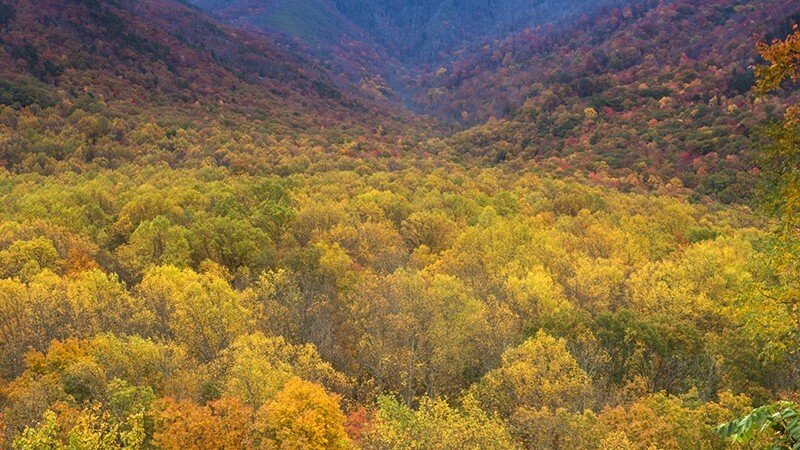 Fall foliage in Great Smoky Mountains National Park is following a similar pattern as last year, when the best display of color occurred in the later weeks of November. Currently, in the upper elevations above 5,000 feet, fall color is sporadic, with some trees defoliated, others at or near peak, and some still slowly turning. Somewhat-less-vibrant colors so far this year could be due to the warm weather we experienced mid-September into October. This week saw the first true cold front, although no major frost has occurred yet below 5,000 feet. In the mid-elevations from 3,000 to 5,000 feet, fall color is just starting. 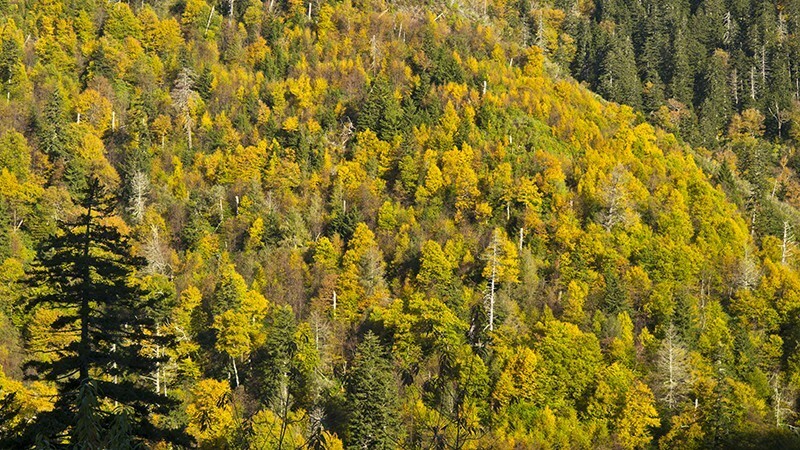 Foliage has begun to yellow, with peak color still a week or more away. In the lower elevations, similar to last year, our foliage may again wait until mid-November to produce its best show. Our trees are still exhibiting considerable amount of green in the canopy with most just showing signs of changing. Another high pressure system is producing above-average temperatures currently, although early next week should bring a cold front with rain and temperatures into the 40s with lows below freezing. We could even see our first snow Wednesday, Oct. 25. This upcoming cold front should advance the change of fall foliage, and mid-elevations could see brilliant displays of color by next weekend. Rabbit Creek (B-E) – Most of the foliage that has changed is a faded pale yellow color with a lot of brown on it. There are a few Sourwood and Red Maple trees that have pretty foliage as well as one Sweet Gum. Lynn Camp Prong (From Middle Prong Trail to Campsite #28) - Most of the foliage that has changed colors is a pale faded yellow color with a lot of brown showing on it. There are a few Red Maple, Sourwood and Sugar Maple with colorful foliage. Because of fog, I could not see the surrounding ridges, which usually have nice foliage at this time of year. Currently, fall color is a patchwork of peak colors in the mid elevations to peak color at the higher elevations. Fall color is not as strong this year, and a lot of trees are not as vibrant as in previous years. 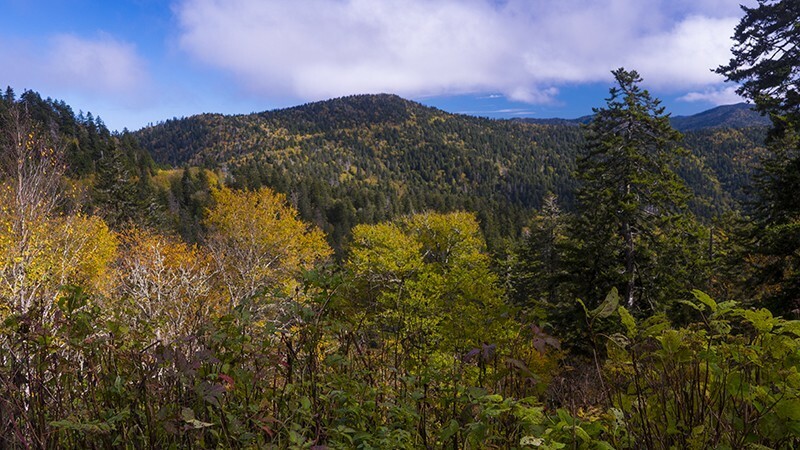 The higher elevations are often at peak during the first couple weeks of October, along the Clingmans Dome road a patchwork of fall colors are visible along the Clingmans Dome Road. This year, it's about a week off from normal. Due to the lack of considerable cold fronts from September into mid-October, along with mostly dry conditions with only a few rain events, these weather conditions are prolonging fall peak. Along Little River Road, in Cataloochee Valley, and elsewhere at the lower elevations, early-changing species like black gum, sourwood, dogwood, sumac, black walnut, buckeye, poison ivy, and Virginia creeper are showing color. This is a great time to take a drive on any road above 4000 feet. Clingmans Dome Road, the Blue Ridge Parkway, or Balsam Mountain Road. A hike to Andrews Bald on Forney Ridge Trail or along the Appalachian Trail to Charlies Bunion would be time well spent. Fall colors are spectacular below elevations of 3,000 feet in the Great Smoky Mountains right now. And even though it is mid-November, the number of green leaves still on the trees indicates that the absolute peak of colors in the valleys and lowlands of the Smokies is still a few days off. Great places to enjoy the colors include Little River Road, Laurel Creek Road to Cades Cove, Cataloochee, and Newfound Gap Road. Recommended trails are Little River, Deep Creek, Porters Creek, Lower Mt. Cammerer, Old Sugarlands, and Oconaluftee River. Don’t wait any longer if you haven’t yet had a chance to enjoy the beauty of autumn in the Smokies. 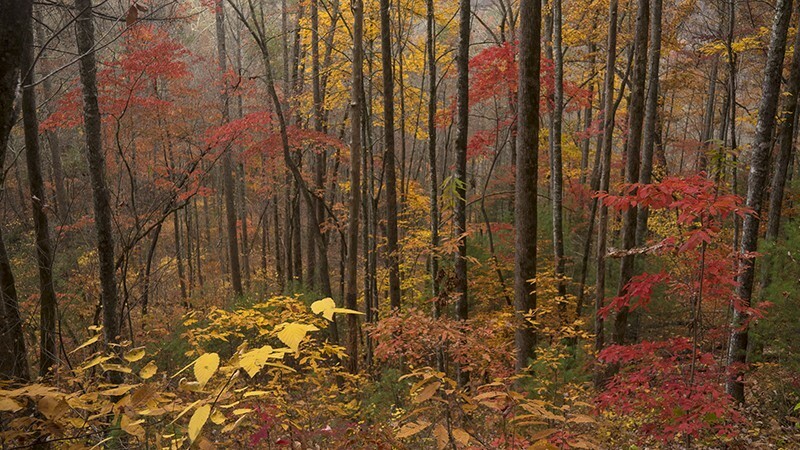 Little River Trail (B to Cucumber Gap Trail) – Approximately 80% of the colorful foliage has fallen. There are a few trees scattered around with some colorful foliage. Cucumber Gap Trail (B-E) – A few trees have some colorful leaves on them, but most of the leaves have fallen. Little River Road (From US 441 to Townsend Wye) – Most of the colorful leaves have fallen. A few trees have some colorful foliage on them especially around Metcalf Bottoms. This is the time to take a hike or drive in the Great Smoky Mountains! Fall colors are gorgeous almost everywhere, from the lower elevations to nearly 6,000 feet. Little River Road, Newfound Gap Road, Tremont, and Cataloochee are especially colorful. Don’t wait! The autumn crowds have thinned a bit since last week, so this is prime time for spectacular fall color viewing (and weather) in the Smokies. Ace Gap (B-E): Some really nice colorful foliage. Many Red Maple, Sugar Maple, Scarlet Oak, Blueberry, Beech, Hickory, Sourwood, Umbrella Magnolia and Sassafras with nice bright foliage. Fall colors are approaching peak at the middle elevations (2,500’ – 4,000’) of the Great Smoky Mountains. Spectacular autumn scenery awaits visitors for the next several days. Suggested drives include Newfound Gap Road, The Gatlinburg Bypass, Parson Branch Road, the Foothills Parkway (East and West), Lakeview Drive, and Little River Road. Next week will be a superb time to visit Look Rock Tower on Foothills Parkway west. Though we are quickly approaching the end of October, the lower elevations of the park continue to offer vibrant hues with others remain mostly green. Look for colors to advance rapidly with a lowland peak through early November. Suggested hikes include Rich Mountain Loop, Deep Creek Trail, Thomas Divide Trail, Middle Prong Trail, Smokemont Loop Trail, and Little River Trail. Traffic on Saturday and Sunday afternoons and evenings will be extremely heavy on Newfound Gap Road and Cades Cove Loop. At these times motorists would be wise to seek other destinations such as Roaring Fork Motor Nature Trail, the Blue Ridge Parkway, Foothills Parkway East and West, Tremont Road, and the Deep Creek area. Or travel early in the day. Fall colors are at peak at the highest elevations of the Great Smoky Mountains right now. Yellow birch, American beech, pin cherry, witch-hobble, and mountain maple are all showing excellent color. A few maples are showing brilliant reds. Yet most foliage is still green below elevations of 2,500 feet. Good places to see fall color include Newfound Gap Road, Clingmans Dome Road, the Blue Ridge Parkway, and Heintooga Ridge Road to Balsam Mountain Campground. Little River Road is also said to be showing some excellent early color. Suggested hikes: Thomas Divide Trail, the Appalachian Trail to Charlies Bunion, Sweat Heifer Trail, the spruce-fir self-guiding nature trail, Gregory Bald Trail, and Mt. Cammerer. At the lower elevations, the cool nights are moving fall colors right along. Blackgum, dogwood, sumacs, and sourwood trees continue to show vivid reds. Golds are coming along on black walnut, birch, beech, and hickories. The peak of color at the lower elevations will likely be at the end of October and last into early November. Suggested hikes: Rich Mountain Loop, Chestnut Top Trail, Smokemont Loop, and Deep Creek Trail. Fork Ridge (B-E) – Many brilliant leaves – Sourwood, Red Maple, Scarlet Oak, Beech, Sugar Maple, Blueberry and Witch Hobble. 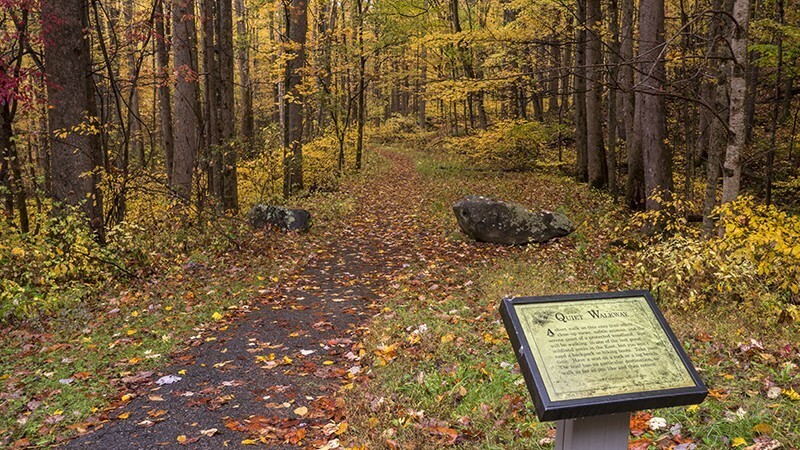 Deep Creek (US 441 to Campsite #53) – Surrounding ridges have a number of trees with brilliant foliage. Most of the trees close to the trail that have nice foliage are Beech trees. US 441 (From the Chimney Tops Trail (First tunnel) to Newfound Gap and down N.C. side to the Deep Creek Trailhead). This area’s foliage is at peak display if not slightly beyond peak. Some of the ridges are covered with breathtakingly beautiful bright foliage. Folks that would enjoy the nice displayed foliage probably should try to get up 441 before the rain hits Thursday, which will likely knock down much of the colorful leaves. The lower elevations have some nice foliage but not at peak for the most part – not as colorful as the higher elevations. Fall colors are nearing peak in a few isolated areas of the Great Smoky Mountains right now. At the higher elevations, yellow birch, American beech, pin cherry, American mountain-ash, witch-hobble, and mountain maple are all showing good color. A few maples are displaying brilliant reds. 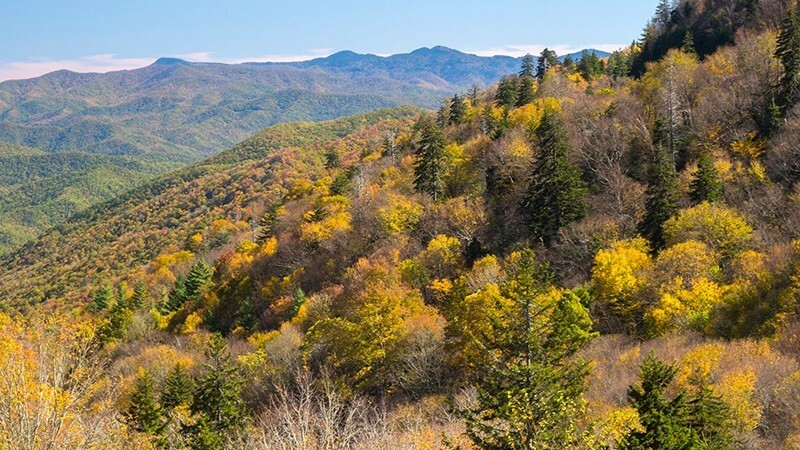 Good places to see fall color include Newfound Gap Road, Clingmans Dome Road, the Blue Ridge Parkway, and Heintooga Ridge Road to Balsam Mountain Campground. Suggested hikes: Thomas Divide Trail, the Appalachian Trail to Charlies Bunion, Sweat Heifer Trail, the spruce-fir self-guiding nature trail, and Mt. Cammerer. At the lower elevations, sunny days and cool nights are moving fall colors along at a quickening pace. Black gum, dogwood, sumacs, and sourwood trees continue to show vivid reds. Golds are coming along on black walnut, birch, beech, and hickories. A few scattered maples are beginning to show bright colors. The peak of color at the lower elevations is not likely to occur until early November, however, color is very good in some scattered locations such as the Foothills Parkway West and along Little River Road. Suggested hikes: Rich Mountain Loop, Chestnut Top Trail, Smokemont Loop, and Deep Creek Trail. Traffic will be very heavy on Newfound Gap Road and Cades Cove Loop Road over the next week. Allow extra time for your travels, or visit less-busy areas of the park such as Deep Creek, Big Creek, Twentymile, Cosby, Greenbrier, Fontana, and the Foothills Parkway. This year is proving to be a difficult one in which to predict the progress of falls colors. Late summer and early fall in the Smokies have been warm and dry. While the dry conditions are stressing the trees, it has been noted in the past that drought years have provided some of the brightest fall colors. Currently, colors are on the late side. While the higher elevations are often at peak during the first couple weeks of October, they are off this year by about two weeks. This is a great time to take a drive on Clingmans Dome Road, the Blue Ridge Parkway, or Balsam Mountain Road. A hike to Andrews Bald on Forney Ridge Trail or along the Appalachian Trail to Charlies Bunion would be time well spent. Look for peak color at the lower and mid elevations in early November. While the cool nighttime temperatures should hasten the color change significantly, it is difficult to predict the effects of the drought. Lumber Ridge (B-E) – Sourwood, Red Maple, Blue Berry, Beech and Sassafras foliage is changing to the fall colors. About 3 miles up the trail the Sourwood has brilliant foliage. Meigs Mountain (From Lumber Ridge Trail to Curry Mountain Trail) – Sourwood, Red Maple, Tulip Poplar and Beech are changing to their fall wardrobe. Gabes Mountain (B-E) and Maddron Bald (B to Gabes Mountain Trail) - Some Red Maple, Sourwood, Frazer Magnolia and Beech foliage are changing to their fall colors. Not a lot of change at this elevation. 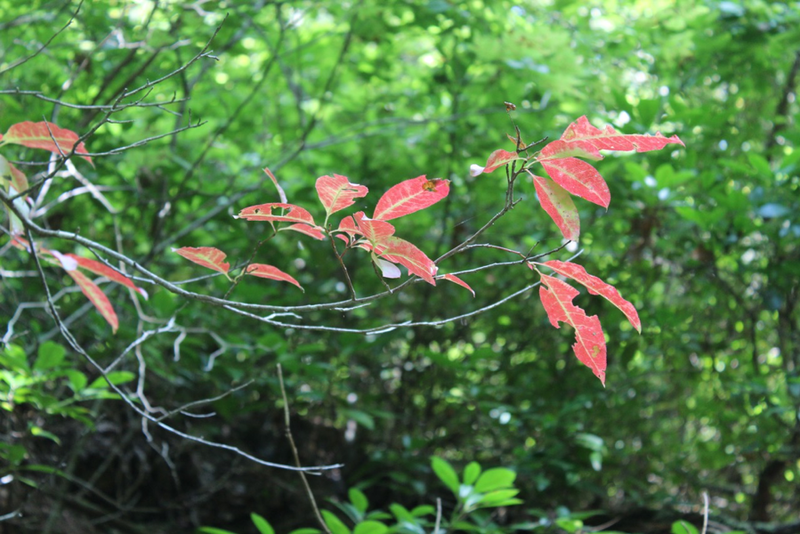 Rabbit Creek (B to Hannah Mountain Trail) – Sourwood, Sassafras, Blueberry, and Blackberry are showing some bright red leaves. Fall colors in the Great Smoky Mountains are truly spectacular right now. Many locals are saying these are the best colors they have seen in the Smokies for many years. The combination of soaking rains in early October, then two full weeks of sunny days and cool nights, seem to have done the trick! The best colors are at elevations below 3,500’. Good color should continue in the valleys and lower elevations into the first week of November. Good places to see fall color include Tremont Road, Deep Creek area, Foothills Parkway East and West, Greenbrier, Little River Road, Lake View Drive, and Cades Cove. Suggested hikes: Rich Mountain Loop, Chestnut Top Trail, Huskey Gap, Little River Trail, Smokemont Loop, Old Settlers Trail, and Deep Creek Trail. Traffic should be lighter this week than last. The elk rut is still going on in North Carolina. Appalachian Trail (From Newfound Gap to Sweat Heifer Creek Trail) – Almost all foliage has fallen – very little colorful foliage. Sweat Heifer Creek Trail (B-E) – First mile not a lot of colorful foliage – last 2.7 miles has very brilliant foliage – at peak – Lots of yellow and bright red, orange, gold and pink foliage scattered about beside the trail and on the surrounding ridges. Kephart Prong Trail (B to Kephart Shelter) – Mostly bright yellow foliage with a few red and gold foliage – foliage at peak. US 441 (From Kephart Trailhead to Newfound Gap) – Foliage at peak most of the way to Newfound Gap. Lot of bright yellow foliage with a good amount of bright red, orange and gold foliage scattered along the road and on the surrounding ridges. Also, there is some pink foliage. US 441 (Newfound Gap and down to Alum Cave Bluff Trailhead) – Much of the foliage has fallen. Still some scattered nice colorful foliage. US 441 (Alum Cave Bluffs to Sugarlands Visitor Center) – Foliage display at peak – very beautiful even with the rain – Mostly yellow foliage with some red, orange, gold and pink foliage. Little River Road (From Sugarlands Visitor Center to Elkmont) – Very nice foliage – mostly yellows with decent amount of red, orange, gold and pink foliage. The Sumac coming up Fighting Creek Ridge is especially bright and beautiful. Little River Road (From Elkmont to the Sinks) – Foliage at peak – very brilliant – mostly yellow foliage with some red, orange, gold and pink foliage. Little River Road (From the Sinks to the Wye) – Foliage appears slightly beyond peak – mostly yellow leaves with some red, orange, gold and pink foliage. NOTE: HIGH WINDS PREDICTED TOMORROW (TUESDAY) IN THE PARK. OF COURSE THAT COULD RESULT IN MUCH OF THE FOLIAGE FALLING. 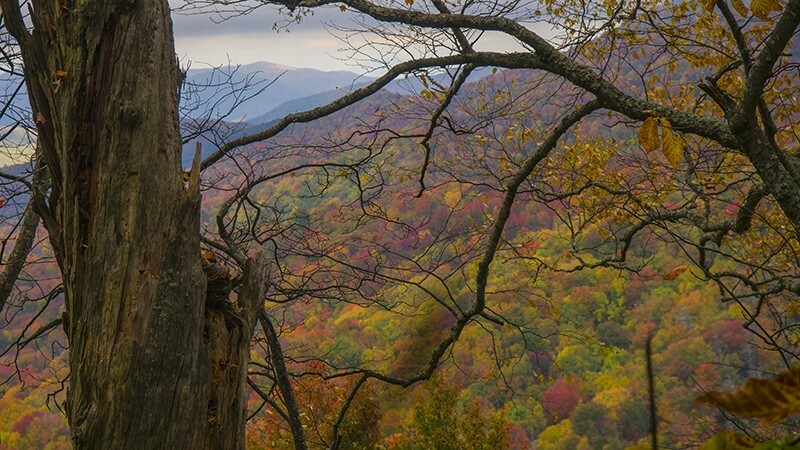 Fall colors are now at their peak at the middle elevations (2,500’ – 4,000’) of the Great Smoky Mountains. Spectacular autumn scenery awaits visitors for the next several days. Suggested drives include Newfound Gap Road, The Gatlinburg Bypass, Parson Branch Road, the Foothills Parkway (East and West), Lakeview Drive, and Little River Road. Next week will be a superb time to visit Look Rock Tower on Foothills Parkway west. The lower elevations are a patchwork quilt of hues with some areas near peak while others remain mostly green. Look for colors to advance rapidly now with a lowland peak from October 26 through early November. Suggested hikes include Rich Mountain Loop, Deep Creek Trail, Thomas Divide Trail, Middle Prong Trail, Smokemont Loop Trail, and Little River Trail. Traffic on Saturday and Sunday afternoons and evenings will be extremely heavy on Newfound Gap Road and Cades Cove Loop Road through October 27. At these times motorists would be wise to seek other destinations such as Roaring Fork Motor Nature Trail, the Blue Ridge Parkway, Foothills Parkway East and West, Tremont Road, and the Deep Creek area. Or travel early in the day. Fall colors are at or past peak at the highest elevations of the Great Smoky Mountains right now. Yellow birch, American beech, pin cherry, witch-hobble, and mountain maple are all showing good color. A few maples are showing brilliant reds. Yet most foliage is still green below elevations of 2,500’. This week’s colors seem to be especially brilliant at elevations between 3,000-5,000 feet. Good places to see fall color include Newfound Gap Road, Clingmans Dome Road, the Blue Ridge Parkway, and Heintooga Ridge Road to Balsam Mountain Campground. Suggested hikes: Thomas Divide Trail, the Appalachian Trail to Charlies Bunion, Sweat Heifer Trail, the spruce-fir self-guiding nature trail, Gregory Bald Trail, and Mt. Cammerer. At the lower elevations, sunny days and cold nights are moving fall colors right along. Blackgum, dogwood, sumacs, and sourwood trees continue to show vivid reds. Golds are coming along on black walnut, birch, beech, and hickories. The peak of color at the lower elevations will likely be at the end of October and last into early November. Suggested hikes: Rich Mountain Loop, Chestnut Top Trail, Smokemont Loop, and Deep Creek Trail. Traffic will be very heavy on Newfound Gap Road and Cades Cove Loop Road over the two weeks. Allow extra time for your travels, or visit less-busy areas of the park such as Deep Creek, Big Creek, Twentymile, Cosby, Fontana, and the Foothills Parkway. Not many trees have changed much on Lead Cove Trail – some Beech, Frazer Magnolia, Virginia Creeper, Red Maple, Sourwood and Tulip Poplar. Bote Mountain, from Lead Cove Trail to Finely Cane Trail, first 3/4 mile down from the Lead Cove Trail sections have brilliant red Sourwood and Red Maple. There are some nice displays of Blueberry, Sugar Maple, Sassafras, Scarlet Oak and Beech. An unusual early October soaking rain has eliminated the threat of a drought-shortened fall color season in the Great Smoky Mountains. Rarely has there been such a lush and verdant fall! Colors are now at peak at the very highest elevations of the national park. Yellow birch and American beech trees are sporting rich golds and yellows. These colors are punctuated by reds from fire cherry, sugar maple, witch hobble, and sumac. Barring high winds, this high elevation peak should last into mid October. Along Little River Road, and elsewhere at the lower elevations, early-changing species like blackgum, sourwood, dogwood, sumac, black walnut, buckeye, and Virginia creeper are showing color. This is a great time to take a drive on Clingmans Dome Road, the Blue Ridge Parkway, or Balsam Mountain Road. Little River and Laurel Creek roads also offer pleasant fall scenery. A hike to Andrews Bald on Forney Ridge Trail or along the Appalachian Trail to Charlies Bunion would be time well spent. Look for peak color at the lower and mid elevations at the end of October and into early November. This week’s expected weather pattern of sunny days and cool nights should usher in a spectacular fall color season in the Smokies. Fall colors are now at peak at the very highest elevations of Great Smoky Mountains National Park. Yellow birch and American beech trees are sporting rich golds and yellows. These colors are punctuated by reds from fire cherry, sugar maple, witch hobble and sumac. Barring high winds, this high elevation peak should last into the first week of October. Along Little River Road and elsewhere at the lower elevations, early-changing species like blackgum, sourwood, dogwood, sumac, black walnut, buckeye and Virginia creeper are showing color. This is a great time to take a drive on Clingmans Dome Road, the Blue Ridge Parkway and Balsam Mountain Road. Little River and Laurel Creek roads also offer pleasant fall scenery. A hike to Andrews Bald on Forney Ridge Trail or along the Appalachian Trail to Charlies Bunion would be time well spent. Look for peak color at the lower and mid elevations in late October and early November. Thus far, a nice blend of cool nights and sunny days, with periods of gentle rain, could portend a spectacular fall season in the Smokies. At long last, it’s fall color time in the Great Smoky Mountains! The highest elevations are now showing rich golds from yellow birch and American beech trees and some reds from maples. The peak of fall colors at the highest elevations should be September 28-October 5. This is a great time to take a drive on Clingmans Dome Road, the Blue Ridge Parkway, or Balsam Mountain Road. Little River and Laurel Creek roads also offer pleasant fall scenery. A hike to Andrews Bald on Forney Ridge Trail or along Thomas Divide Trail would be time very well spent. Look for peak color at the lower and mid elevations in late October and early November. The elk rut is also well underway. The best places to witness this are Cataloochee valley and the fields near Oconaluftee Visitor Center. ALERT: If the federal government fails to pass a continuing budget resolution, Great Smoky Mountains National Park and 400 other National Park Service sites will be closed indefinitely effective October 1. Fall colors are coming on strong at the highest elevations in the park. On Clingmans Dome Road (elevation 5,050’ - 6,300’), yellow birch trees are showing good color. Fire cherry trees and witch hobble shrubs have also changed to red and burgundy. The peak of fall color at the highest elevations is expected to be the last week of September. At the lower elevations, along Little River Road (Gatlinburg area) and Lake View Drive (Bryson City area), early changers are just starting to show fall color. There are some golds from birches, tuliptrees, and yellow buckeyes and some reds from sourwoods, blackgums, dogwoods, and Virginia creepers. Parkwide, the peak of fall colors generally occurs between late October and early November. A late-summer dry spell has caused a few trees to get a head start on their fall color change. Scattered tuliptrees, sourwoods, and some maples are already showing patches of autumn hues. Sourwood trees on the drier slopes and Virginia creeper vines are showing nice reds now. Witch-hobble leaves at the higher elevations are burgundy. A smattering of dogwood trees has begun the change. Blackgum trees will soon be blushing red. Fruits, such as the fuchsia seedpods of magnolia trees, are now conspicuous. By late September look for more color at the higher elevations as American beech and yellow birch trees transition to gold. Early changers at the lower elevations like sourwood, blackgum, dogwood, yellow buckeye, sumacs, and tuliptree should then be near peak toward the end of the month. Parkwide, the peak of fall colors generally occurs between late October and early November. The elk rut is now in full swing. Good places to see elk include Cataloochee Valley and the fields around Oconaluftee Visitor Center. Approaching elk or bear closer than 50 yards is strictly prohibited. Some fields will be closed to the public during the rut. Although it’s only late August, the first signs of autumn are appearing here and there in the Great Smoky Mountains. Along the Appalachian Trail and on Mount Le Conte, hobblebush (a shrub) is turning a deep burgundy color. At least two maples along Newfound Gap Road (U.S. 441) are showing early signs of red, as well. Lower down, a few yellow buckeye trees are showing bright red leaves. By mid-September, early changers like sourwood, blackgum, and dogwood trees will be showing their fall hues. Fall colors usually reach their peak in early October in the park’s high country and during late October or early November at the lower and mid elevations. Mid-October is a very busy time in the area. Those wishing to plan a fall color trip that avoids some of the heaviest crowds often visit at the very end of October or in early November. Rabbit Creek (From Abrams Creek Ranger Station to Hannah Mountain Trail) - Estimated 65 to 70% of colorful foliage gone but still plenty of nice yellow, orange, gold and bronze foliage along with scattered red foliage. Hannah Mountain (From Rabbit Creek Trail to Campsite #14) – Estimated 65 to 70% of colorful foliage gone but still nice selection of yellow, orange, gold and bronze foliage along with decent amount of red foliage. One distance ridge top was covered with checkerboard dark green (pines and hemlocks) and red patches. Could not tell what the red foliage was from the distance. Note: Good number of Scarlet Oak, Red Maple, Sugar Maple, Sourwood and Blueberry with colorful foliage with some blackberry, Hickory, Sweet Gum and Sassafras with nice colorful foliage. The Last Hurrah for fall colors in the Great Smoky Mountains is now unfolding. At the lowest elevations and foothills of the national park, colors are at or near peak. Maples, oaks, sweetgums, birch, and sourwood are putting on an impressive show. Now is not the time to hesitate if you want to catch some great fall colors this year. Good places to see the colors include the Deep Creek area, Little River Road, Lakeview Drive, and Laurel Creek Road to Cades Cove. Suggested hikes include Old Sugarlands Trail, Oconaluftee River Trail, Gatlinburg Trail, Grapeyard Ridge Trail, and the Three-waterfalls-loop off of Deep Creek Trail. Shazam! Fall colors are now at peak in the Great Smoky Mountains and it is proving to be a spectacular year! Below 3,500 feet the fall colors could not be much better. And with the added touch of high country snow in the forecast, there should be some very memorable scenes to savor. Suggested hikes include Oconaluftee River Trail, Mingus Creek Trail, Huskey Gap Trail, Chimney Tops Trail, and Laurel Falls Trail. Little River Road, Tremont Road, Deep Creek Road, and Newfound Gap Road are superb. Traffic should be lighter this week than last. The elk rut is still going on in North Carolina and a herd has been very visible at Oconaluftee Visitor Center. It’s prime time for fall colors in the Great Smoky Mountains! This grand finale at the lower and mid-elevations will likely continue into early November as oaks and maples continue to turn. As in years past, peak colors come on quickly and are relatively short-lived. It’s a whole lot better to be a little early to the show than too late. Good places to see fall color include Newfound Gap Road, Tremont Road, Cades Cove, and Little River Road. Suggested hikes: Little River Trail, Meigs Mountain Trail, the Cove-Hardwood self-guiding nature trail, Smokemont Loop, Chestnut Top Trail, Huskey Gap, and Deep Creek Trail. Parting rain showers Wednesday morning should provide favorable light for serious photographers. Fall colors are at or near peak this week in several areas of the Great Smoky Mountains. Yellow birch, American beech, pin cherry, American mountain-ash, witch-hobble, and mountain maple are all showing excellent color. A few maples are showing brilliant reds, yet some foliage is still green below elevations of 2,000’. A grand finale of colors at the lower and mid elevations will likely begin this week and continue into early November. As in years past, peak colors come on quickly and are relatively short-lived. It’s a whole lot better to be a little early to the show than too late. Good places to see fall color include Newfound Gap Road, Tremont Road, and Balsam Mountain Road off the Blue Ridge Parkway. Suggested hikes: Thomas Divide Trail, Sweat Heifer Trail, the Cove-Hardwood self-guiding nature trail, Gregory Bald Trail, Smokemont Loop, and Mt. Cammerer. At the lower elevations, sunny days and cool nights are moving fall colors along. Parting rain showers Wednesday morning should provide favorable light for serious photographers. Black gum, dogwood, sumacs, and sourwood trees continue to show vivid reds. Golds are coming along on tuliptree, black walnut, birch, beech, and hickories. A few scattered maples are beginning to show fall colors. Suggested hikes: Rich Mountain Loop, Chestnut Top Trail, Huskey Gap, and Deep Creek Trail. Fall colors are at or near peak this week in many areas of the Great Smoky Mountains. Yellow birch, American beech, pin cherry, American mountain-ash, witch-hobble, and mountain maple are all showing excellent color. A few maples are showing brilliant reds. Yet some foliage is still green below elevations of 2,500’. This year’s colors seem to be especially brilliant on the North Carolina side of the national park. At the lower elevations, sunny days and cool nights are moving fall colors along. Black gum, dogwood, sumacs, and sourwood trees continue to show vivid reds. Golds are coming along on tuliptree, black walnut, birch, beech, and hickories. A few scattered maples are beginning to show fall colors. The peak of color at the lowest elevations is several days away. Suggested hikes: Rich Mountain Loop, Chestnut Top Trail, Smokemont Loop, and Deep Creek Trail. Traffic will be very heavy on Newfound Gap Road and Cades Cove Loop Road over the next week. Allow extra time for your travels, or visit less-busy areas of the park such as Deep Creek, Big Creek, Twentymile, Cosby, Fontana, and the Foothills Parkway. One thing’s for certain, there is no threat of drought ruining the fall color show this year! Yesterday over 5.5” of rain inundated Mt. Le Conte and the Smoky Mountain high country, causing Clingmans Dome Road to temporarily close and a brief evacuation of Elkmont Campground. If you have ever wanted to photograph a raging waterfall surrounded by fall colors, your time is now. Fall colors have come on strong this week. They are now at peak at many higher and mid-elevation locations. Yet this year’s color display is especially nonsynchronous—there are areas of rich color all over the park, contrasted by other areas that remain mostly green. At the lower elevations, sunny and drier locations are being lit up by sourwoods, dogwoods, birches, beeches, and sumac. They are stunning, especially in evening and under clouds. Little River and Laurel Creek roads have excellent color right now. Cades Cove is surrounded by mountains that are at peak. If you want to beat the crowds and enjoy fall splendor, try the Blue Ridge Parkway, The Foothills Parkway East and West, Heintooga Ridge and Balsam Mountain roads, and the Deep Creek and Greenbrier areas of the park. Suggested hikes include Little River Trail, Deep Creek Trail, Abrams Falls, and Hen Wallow Falls. Over the next 2-3 weeks, various areas of the park will have excellent color displays. Fall color season is continuing its slow progression in the Great Smoky Mountains. The very highest elevations are showing some impressive golds from yellow birch and American beech trees and a few nice pockets of reds from maples. 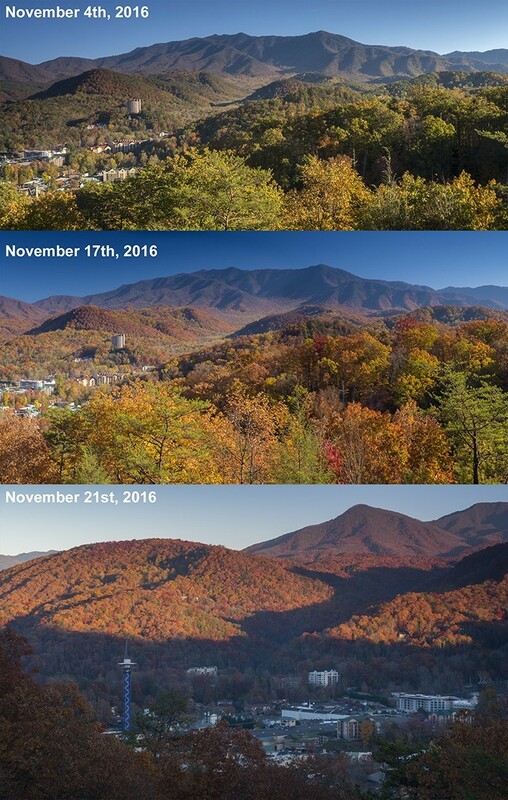 Overall though, it looks like the peak of color in the Smokies will be on the late side this year. At the higher elevations (above 4,000’), this is predicted to be October 12-20. Along Little River Road, and elsewhere at the lower elevations, early-changing species like blackgum, sourwood, dogwood, sumac, black walnut, buckeye, poison ivy, and Virginia creeper are showing nice color. This is a great time to take a drive on Clingmans Dome Road, the Blue Ridge Parkway, or Balsam Mountain Road. Little River, Laurel Creek and Lake View roads also offer pleasant fall scenery. A hike to Andrews Bald on Forney Ridge Trail or along the Appalachian Trail toward Silers Bald would be time well spent. Although there are some cloudy days in the forecast, the moody light often enhances the quality of colors to both the eye and camera. Look for peak color at the lower and mid elevations at the very end of October and into early November. The warmer, wet weather over the weekend should keep the pace of change on the slow side. Remember, though, it’s much better to be early for the peak of colors in the Smokies, than late. At long last, it’s fall color time in the Great Smoky Mountains! The highest elevations are now showing impressive golds from yellow birch and American beech trees and nice reds from maples. The peak of fall colors at the higher elevations should be October 4-10. Along Little River Road, and elsewhere at the lower elevations, early-changing species like blackgum, sourwood, dogwood, sumac, black walnut, buckeye, and Virginia creeper are showing better and better color. This is a great time to take a drive on Clingmans Dome Road, the Blue Ridge Parkway, or Balsam Mountain Road. Little River and Laurel Creek roads also offer pleasant fall scenery. A hike to Andrews Bald on Forney Ridge Trail or along Thomas Divide Trail would be time well spent. Look for peak color at the lower and mid elevations in late October and early November. 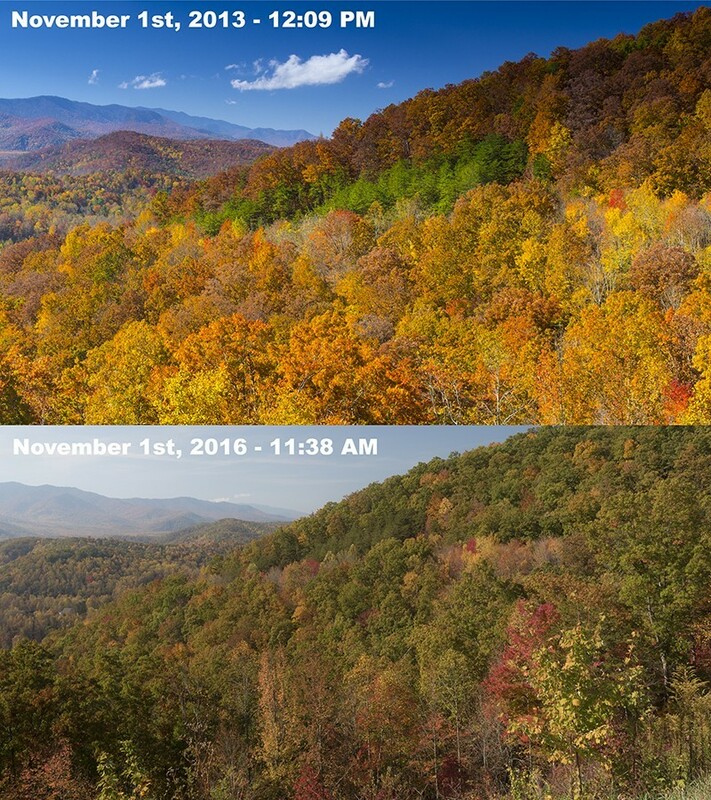 The strong cold front dipping down into the Smokies this weekend is rapidly advancing the pace of color change. Ploddingly, grudgingly, fall colors are starting to change in the Great Smoky Mountains. Though the pace of change has quickened, the advance of leaf colors is later than average. This means we likely have four to five more weeks to enjoy the transition before leaf colors peak and trees begin dropping leaves. At the very highest elevations, leaves are progressing more rapidly after a light frost earlier this week. Still, only about 20%-30% of deciduous leaves have changed thus far. Lower down, several species of trees have started to brighten. Sycamore, sassafras, witch hazel, walnut, tuliptree, black gum, sourwood, Virginia creeper, sumacs, and buckeye are all showing color. Migrating birds are flocking to the dogwoods’ red berries. Fall wildflowers are also conspicuous, including jewelweed, asters, goldenrod, and white snakeroot. Good places for a drive include Clingmans Dome Road and the Blue Ridge Parkway. It’s a great time to hike Mt. Le Conte! Upper Deep Creek Trail is also gorgeous this time of year. The peak of fall colors at the higher elevations is likely a week or so away. At the lower and mid elevations, colors are trending toward a very late October or early November peak. The progress of fall colors in the Great Smoky Mountains may be about to shift from neutral and into gear. The last two weeks have been unusually warm and damp, and colors have not progressed much. But with nighttime lows now hitting the lower 40s and upper 30s, that should rapidly change. Lower down, several species of trees have just started to change. Sycamore, sassafras, witch hazel, buckeye, tuliptree, black gum, sourwood, Virginia creeper, sumacs and black walnut are all showing hints of color. Migrating birds are flocking to the dogwoods’ red berries. Fall wildflowers are also conspicuous, including jewelweed, asters, goldenrod and white snakeroot. The peak of fall colors at the higher elevations is likely to be at least 10 days away. At the lower and mid elevations, colors traditionally peak in late October or early November. At this time, we predict colors will be on the later side. Park officials are happy to see a bumper crop of oak acorns, which should help black bears gain the weight they need to make through the winter. With sunny days and cool nights in the forecast, the march of fall colors should be picking up the pace very shortly. Reports from New England portend that the timing of this year’s colors may be normal to a tad late across the Appalachians. Sourwood trees on the drier slopes are showing nice reds now. Witch-hobble leaves at the higher elevations are burgundy. A smattering of dogwood trees have begun the change. Blackgum trees will soon be blushing red. Fruits, such as the fuchsia seedpods of magnolia trees and oak acorns are now conspicuous. By late September look for more color at the higher elevations as American beech and yellow birch trees transition to gold. Early changers at the lower elevations like sourwood, blackgum, dogwood, yellow buckeye, Virginia creeper, sumacs, and tuliptree should then be near peak. Parkwide, the peak of fall colors generally occurs between late October and early November. The elk rut is now in full swing in both Cataloochee Valley and at the Oconaluftee Visitor Center area; and bears are busy gobbling acorns in Cades Cove. Witch Hobble, Sourwood, Dogwood, Red Maple and Blueberries on Sugarland Mountain. This week’s warm, wet weather has slowed the march of fall colors in the Great Smoky Mountains. Still, sourwood trees on the drier slopes are showing some early pink and crimson colors. Witch-hobble leaves at the higher elevations are mostly burgundy now. Blackgum trees are just beginning to blush red. Fruits, such as the fuchsia seed pods of magnolia trees and oak acorns are now conspicuous. By late September look for more color at the higher elevations as American beech and yellow birch trees transition to gold. Early changers at the lower elevations like sourwood, blackgum, dogwood, yellow buckeye, Virginia creeper, sumacs, and tuliptree should then be near peak. Parkwide, the peak of fall colors generally occurs between late October and early November. When the next cold snap arrives in a couple of days, we should have a better read on whether autumn will be early this year or not. Hello September! Witch hobble has turned a rich crimson hue at the higher elevations. Its bright red berries are also quite conspicuous. The very earliest yellow birch trees are also beginning to change, as are some pin cherry leaves (all at the highest elevations). In the valleys, a few dogwood and sourwood trees are reddening, as is poison ivy and Virginia creeper. Spicebush is sporting red berries. If the forecast of warm, wet weather proves true, there likely won’t be any significant change of fall color this week.Late summer wildflowers continue to be spectacular with jewelweed, goldenrod, New York ironweed, cardinal flower, white snakeroot, gentian, and grass-of-Parnassus, putting on spectacular shows. Surprisingly, vibrant relicts of the fall color season persist in pockets and sheltered coves of the Great Smoky Mountains. Several types of oaks, especially scarlet oak, and some other tree species, including sourwood, sweetgum, and some maples, continue to hoard their leaves. Good places to enjoy the last of the colors include Little River Road, Rich Mountain Road, Greenbrier, and the Tremont area. Chances are good there will be some snow in the high country by Wednesday. Though many trees are now bare, a remarkable palette of rich, late autumn colors linger in areas at the lower and mid elevations. Many of the best colors are in sheltered coves and lower elevation ridges. Recommended drives include Little River Road, Cades Cove Loop Road, Rich Mountain Road, and Foothills Parkway east and west. Suggested hikes include Little River Trail, Deep Creek Trail, Look Rock Tower, Smokemont Loop, Huskey Gap Trail, Porters Creek, and Albright Grove. Fall colors in the Great Smoky Mountains are now a patchwork quilt of gorgeous hues with some mountaintops past peak, other sites pre-peak, and several areas now at peak. Most elevations from 3,500-5,500 are now at peak. Areas like Alum Cave Bluffs and Chimney Tops are decorated with eye-popping golds and some red accents. Elevations from 2,500-3,500 feet are still surprisingly green, while at the lowest elevations, along areas like Little River Road, species such as the birches, beeches, sourwoods, dogwoods, and maples are putting on a grand show. Because of the large areas of lingering green, it is now predicted that some fall colors will continue at least through the first week of November. Color hotspots include the Foothills Parkway East and West, Little River Road, Deep Creek, Roaring Fork Motor Nature Trail, Rich Mountain, Cataloochee, and Newfound Gap Road. Good hikes would be Laurel Falls Trail, the Three Waterfalls Loop in Deep Creek, Smokemont Loop, Albright Grove, and Lumber Ridge Trail. Rabbit Creek Ranger Station to Hannah Mountain Trail) – Very brilliant colored foliage on higher elevations of trail. Bright red, hot pink, orange, yellow, maroon, wine colored and gold foliage. Sugar Maples, Sourwood, Red Maples, Blackberry and Blue Berry foliage especially nice. Other colorful foliage: Scarlet Oak, Sassafras, Striped Maple, Hickory and Frazier Magnolia. Hannah Mountain (From Rabbit Creek Trail to Campsite 14) – Scattered beautiful foliage along trail and on surrounding hillsides. The Sugar Maples, Sourwood, Red Maples and Blueberries have outstanding colored foliage. One sourwood was clothed in an amazing bright pink foliage. Other colorful foliage: Scarlet Oak, Sassafras, Striped Maple, Blackberry, Hickory and Frazier Magnolia. SPECIAL NOTE: FOOTHILLS WEST PARKWAY IS BEYOND DESCRIPTION WITH ITS AMAZINGLY BRIGHT FOLIAGE PARTICULARLY IN THE HIGHER ELEVATIONS WHEN THERE IS FULL SUN. IT APPEARS TO BE AT PEAK COLORS. AT THIS TIME (BEFORE LATER WEEK STORMS) IT WOULD BE A SAFE BET TO DIRECT VISITORS TO THIS STRETCH OF ROAD. MOST LIKELY THE FOOTHILLS EAST PARKWAY WOULD BE COMPARABLE. Fall colors are now at peak between elevations of 3,000 feet and 6,000 feet in the Great Smoky Mountains. In the spruce-fir forests at the very highest elevations, the few deciduous trees are now past peak. Colors are especially brilliant along the upper reaches of Newfound Gap Road. At elevations below 3,000 feet, where the forest is rich with maple, oak, hickory, and other hardwood trees, colors will likely peak during the last week of October and the first few days of November. The fall color display is very good to excellent this year with some good reds among the rich golds. 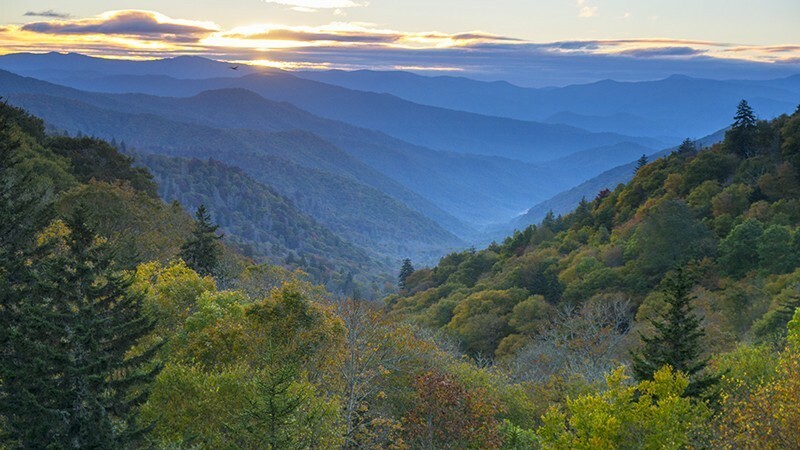 Suggested drives include Little River Road, Cades Cove, the Foothills Parkway East (near Newport and Cosby), the Foothills Parkway West (near Townsend), Roaring Fork Motor Nature Trail, and Cataloochee Valley. Suggested trails and hiking destinations include Smokemont Loop, Cucumber Gap Loop, Lead Cove Trail, Deep Creek Trail, Boogerman loop, Mt. Cammerer fire tower, Spence Field, and Henwallow Falls. Elk have been very conspicuous near Oconaluftee Visitor Center in the evenings. Fall colors are now at their peak at elevations above 4,000 feet in the Great Smoky Mountains. This year’s display is exceptional, perhaps owing to the abundant rainfall through spring and summer and an October with so many sunny days and cool nights. Frost is predicted for much of the park later this week. At the lower elevations, sourwood and blackgum trees are putting on an amazing show with absolutely brilliant reds. Tuliptrees, American beech, and the birches are showing rich golds. There is still plenty of color to come as the maples and oaks are just now starting to turn. Colors will likely peak at the lower elevations during the last week of October and the first days of November. Good places for a drive include the Foothills Parkway East and West, Little River Road, Rich Mountain Road, and Newfound Gap Road. Suggested hikes are Rainbow Falls, Chimney Tops, Alum Cave Bluffs, Smokemont Loop, Kephart Prong, Boogerman loop, and Deep Creek/Indian Creek loop. A bull elk and his harem are very conspicuous around Oconaluftee Visitor Center in the evenings, as well as in Cataloochee Valley. Huskey Gap Trail, Very nice colorful foliage on the last half mile before reaching Huskey Gap (coming from Little River Trail). Offering really nice foliage are: Sugar Maples, Red Maples, Sourwood, Blueberries, Beech trees, Sassafras and Greenbriers. Fall colors are now at peak at the higher elevations of the Great Smoky Mountains. They are especially brilliant along Newfound Gap Road between Chimney Tops overlook and Newfound Gap. At elevations below 3,500 feet, where the forest is rich with maple and oak trees, colors will likely peak in six to 10 days. The fall color display is very good to excellent this year with some good reds among the rich golds. Suggested drives include Little River Road, Cades Cove, Greenbrier, the Foothills Parkway East (near Newport and Cosby), the Foothills Parkway West (near Townsend), and Cataloochee Valley. Suggested trails and hiking destinations include Smokemont Loop, Cucumber Gap Loop, Old Settlers Trail, Deep Creek Trail, Lower Mt. Cammerer Trail, and Henwallow Falls. Fall colors are now at their peak at the mid and higher elevations of the Great Smoky Mountains. Sunny days and cool nights have lead to excellent colors this year. Good places to view the fall spectacle include Newfound Gap Road and the Blue Ridge Parkway. At the lower elevations the colors are coming on fast. Early changing species like blackgum, sourwood, dogwood, Virginia creeper, tuliptree, and the sumacs are all turning. The peak of color at the lower elevations, where the deciduous all-stars like red maple, sugar maple, sweetgum, and yellow birch are common, should occur within 7-10 days. All trails in Great Smoky Mountains National Park continue to be closed due to the federal government shutdown. Bear, elk, and wild turkey are very conspicuous at this time. Visitors should never approach or harass park wildlife. Approaching elk or bear closer than 50 yards is illegal and punishable by substantial fines and imprisonment. Fall colors are now near their peak at elevations of 5,000 feet and higher in the Great Smoky Mountains. The colors promise to be very good to excellent this year. Good places to view the colors include Newfound Gap Road and the Blue Ridge Parkway. At the lower elevations the colors are coming on slowly but steadily. Early changing species like blackgum, sourwood, dogwood, Virginia creeper, tuliptree, and the sumacs are all turning. The peak of color at the mid and lower elevations should be in late October and early November. In addition, bear, elk, and wild turkey are very conspicuous at this time. Visitors should never approach or harass park wildlife. Approaching elk or bear closer than 50 yards is illegal and punishable by substantial fines and imprisonment. Fall colors at the highest elevations are now approaching peak in the Great Smoky Mountains. The mountaintops are showing rich golds and some reds. In addition, American mountain-ash trees are loaded with red berries. Lower down, several species of trees are showing good color. Sycamore, sassafras, witch hazel, walnut, tuliptree, black gum, sourwood, Virginia creeper, sumacs, and black walnut are all changing. Migrating birds are flocking to the dogwoods’ red berries. Fall wildflowers are also conspicuous, including jewelweed, asters, goldenrod, and white snakeroot. Good places for a drive include the Blue Ridge Parkway and Newfound Gap Road. All trails in the parks are closed due to the shutdown. The peak of fall colors at the lower and mid elevations usually occurs in late October or early November. This year’s colors show special promise due to a wet spring and summer and a perfect combination of sunny days and cool nights this week. A run of sunny days and cool nights has coaxed out scattered patches of fall colors up and down the Great Smoky Mountains. At the lower elevations, early changers like black gum, dogwood, Virginia creeper, sumac, tuliptree, sycamore, and sourwood are displaying nice color. At the mid elevations, yellow buckeyes are shifting to gold while yellow birch, American beech, and some maples are showing autumn hues. At the highest elevations, fall has arrived. American mountain-ash trees are loaded with bright berries. Mountain maple, yellow birch, and berry bushes are also turning. However, the peak of color on the mountaintops is still days away. At the lower and mid elevations, fall color is likely to peak in late October or early November. This has been an extremely wet year in the Smokies and the deciduous trees appear to be holding onto their leaves quite well. During drought years, some trees lose their leaves by the end of September. Recent rain showers have improved the chances of an extended color season this year. Recommended hikes include Forney Ridge Trail to Andrews Bald, Road Prong, Thomas Divide, Mt. Cammerer Tower, Rich Mountain Loop, and Chestnut Top. Good drives are the Blue Ridge Parkway, Little River Road, and Clingmans Dome Road. It’s fall color time in the Great Smoky Mountains! A spell of sunny days and crisp nights is bringing on some attractive early colors. At the higher elevations, American beech, yellow birch, witch-hobble, maples, and several types of berry bushes are showing good color. The bright red berries on American mountain-ash trees are also abundant. Lower down, several species of trees have started to change. Sycamore, sassafras, witch hazel, walnut, black gum, sourwood, Virginia creeper, sumacs, and black walnut are all showing color. Fall wildflowers are also conspicuous, including jewelweed, asters, goldenrod, and white snakeroot. Good places for a drive include Clingmans Dome Road and the Blue Ridge Parkway. It’s a great time to hike Mt. Le Conte! The peak of fall colors at the higher elevations is likely a week or more away. At the lower and mid elevations, colors traditionally peak in late October or early November. Fall color season has begun! At the higher elevations, American Beech, Yellow Birch, and Witch Hobble are turning. At the low and mid-elevations early turners including flowering dogwood, blackgum, sourwood, virginia creeper, and black walnut are showing some good color. The peak of color at the highest elevation is at least two weeks away. Clingmans Dome Road and the Blue Ridge Parkway are the best drives for fall color now! Although we’re still in the first week of September, spots and splashes of fall color are beginning to appear in the Great Smoky Mountains. At the higher elevations, witch-hobble’s big round leaves are turning from green to bright red. American Mountain-ash trees are sporting heavy loads of orange and red berries. In the valleys, early-changers like dogwood, sourwood, Virginia creeper, and blackgum are just beginning to turn. Late summer wildflowers continue to be spectacular with jewelweed, goldenrod, New York ironweed, cardinal flower, white snakeroot, gentian, and grass-of-Parnassus, putting on spectacular shows. Recommended hikes include Clingmans Dome Tower, Forney Ridge Trail to Andrews Bald, Road Prong, Thomas Divide, Mt. Le Conte, and Charlies Bunion. Good drives are the Blue Ridge Parkway and Clingmans Dome Road. Traditionally, fall colors peak in the Great Smoky Mountains in early October at the highest elevations and in late October or early November in the valleys. What will this year bring?